We invite you to enroll in the Finger Lakes Grape Program in 2019. 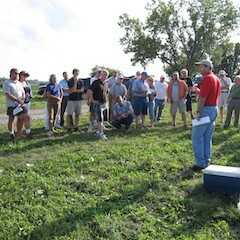 When you enroll in the FLGP, you have a direct link to the latest information from Cornell and other resources around the country on topics that are important to you as a grape grower including pest management, vineyard nutrition, crop management, and farm business and marketing. The Finger Lakes Grape Program is committed to providing you with important and timely information through a variety of means to help you produce the best crop possible, as efficiently as possible. Important announcements about upcoming meetings and workshops. You can also purchase copies of the 2019 New York and Pennsylvania Pest Management Guidelines for Grapes with your enrollment. Stated costs include postage. The Grape IPM Guidelines will again be available online in 2019, but there is a cost to access them. If you are interested in purchasing online access to the Guidelines, you can do so through the Cornell Store. Click this link to go to the ordering page. You can purchase both a hard copy and online access at a discounted rate for each. The enrollment fee for residents of Ontario, Seneca, Schuyler, Steuben, and Yates Counties is $75. The fee for those from other New York counties or other states is $130. Grape growers in Wayne County should contact the CCE Association office at 315-331-8415 for enrollment information. In Region ($75.00) - for those that live, farm or conduct agricultural services within participating counties (listed above). Satellite ($130.00) - for those outside of the participating counties.